Over the past few years I have enjoyed building more steel strings. In many ways it is a very different discipline, requiring a compete re-think of how to brace, and the thickness of the guitar to achieve the needs of the steel string player. Many steel string players need a cutaway. My solution to this problem of access is to build a cutaway which joins at an angle and have the upper left bout extend past the body joint. This design allows me to move the heel of the guitar further back towards the body, giving improved access to upper frets. The other reason for this design is to allow the bridge to be positioned in the centre of the bout, the same position as a 12th fret join but with a little more access than a 14th fret join. Steel strings are given a satin, hand-rubbed and lacquer finish. For decoration I favour either a herring-bone style motif or spalted beech design. Colin's guitars produce a sound familiar to the renowned Spanish guitars giving excellent projection, balance and separation while retaining warmth and depth. 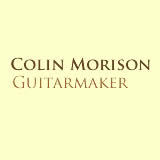 All work undertaken in building the guitars is done by Colin himself. This includes design and manufacture of rosettes and purfling, application of varnish, installing and set-up of frets to name a few of the processes which require expert skill to produce quality instruments. Colin's workshop is located on the north east coast of Scotland. The nearest railway station is Arbroath 6 miles from the workshop. Visitors to the workshop are more than welcome. For more information contact Colin.